Wakame Miso Nut Crumble – a perfect salad tune-up! Another day with the same salad? Healthy snacks nowhere to find? There is help! If you have a dehydrator or kind-of-modern oven this recipe will brighten your day! Rinse the soaked nuts and seeds. 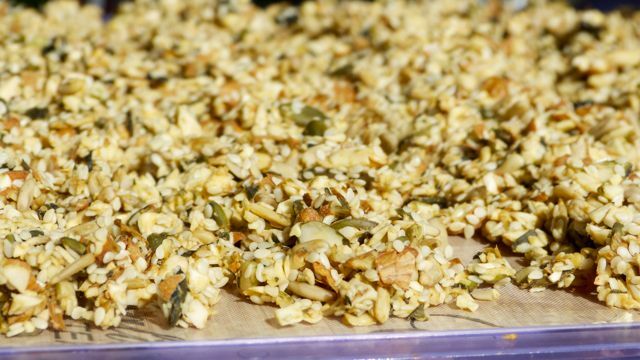 In a food processor pulse the almonds and pumpkin seeds into a coarse crumbly texture. Combine everything in a large mixing bowl and stir well. Let it sit for a while for the seaweed and chia seeds to soak up some of the moisture of the mix. That will help sticking things together when dry. Spread loosely onto Teflex sheets so that enough air can flow through the clusters and the wet mix does not touch the tray above. Start dehydrating at around 145°F, turn down gradually to 115°F and eventually to 105°F. If you have an Excalibur dehydrator make sure to rotate the trays horizontally from time to time and also rotate from the centre out to the top and bottom rack. Should the oven be your only gadget, set the temperature on low: 50°C, turn the fan on, leave the door slightly ajar and go for it! Yes, a few baking trays will do. Dehydrate till crisp and completely dry. Enjoy as crumble over your salads or as individual snack. Miso is one of the few soy-based foods I would actually use. Tamari is the run-off/whey from the Miso production. This entry was posted in Dehydrated Foods, Glutenfree, Raw Food, Raw salad, Raw snacks, Salad recipe, Uncategorized and tagged Auckland raw food, Chef Rene, chia seeds, dehydrated food recipe, healthy living, Miso, new zealand, raw food, raw snack recipe, Rene Archner, Vibrant Earth Creations, Wakame seawed by vibrantearth. Bookmark the permalink.